The humble kettle has been around forever and it doesn’t do a bad job of boiling water. However, a traditional kettle takes time to boil, and we’re all time poor, right? So, prepare to bypass that old-school kettle of yours and upgrade to an instant hot water kettle. An instant kettle can dispense piping-hot water right off the bat, taking mere seconds to come to the boil. All you need to do is top it up with some cold water, press a button and in a few seconds you’ll have ready-to-use boiling water. Another obvious additional benefit with an instant kettle is that they invariably look so much more interesting than a dull-as-ditchwater standard kettle. Even if your last conventional kettle was finished in stainless steel with elegant plastic flourishes, it’s boring. You’ll find an instant kettle is a different beast altogether. Manufacturers have obviously realised that an instant kettle finally gives them a chance to fizz things up a bit. In the main, the models we’ve assembled here come big on bold looks and sizzling styling, as well as being a highly practical solution to the tedium of boiling water. So, what to look for when you’re in the market for a best instant kettle 2019-style? If you’re in need of lots of boiling water on a regular basis then you’ll want to examine how much an instant kettle can serve up at any one time. Some models are one-cup merchants, which is fine for a quick solo brew, but ultimately useless for a monthly meeting of the local tea appreciation society. Lookout for features and functions. Granted, an instant kettle is only really tasked with doing one job: to boil water instantly. But, if it can serve up different amounts at different temperatures then so much the better. Keep an eye on the quality of components too, as cheaply made products can often be affected pretty rapidly if you’re in a hard water area and have to endure the ongoing headache of limescale build-up. A drip-tray that actually works also makes a lot of sense. During the course of our instant hot water research, which meant drinking copious amounts of freshly-brewed tea to make use of said boiled water, we pinned our final selection around three core areas. Firstly, we wanted to find the best instant kettle for 2019. We wanted a model that could do it all, from dispensing instant boiling water through to cutting a dash in the kitchen. We wanted practicality, functionality and features aplenty. And we got that, in the shape of the Breville HotCup Hot Water Dispenser. 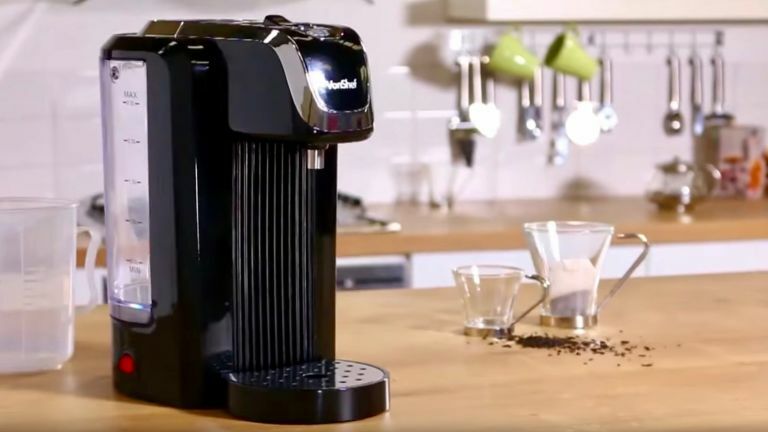 It’s hardly surprising the Breville HotCup Hot Water Dispenser is such a hit with consumers. If you’re looking for an affordable but hugely practical hot water dispenser then this appliance is up there with the best of them. It can supply you with five 250ml cups of hot water without refilling, which is more than adequate for average needs. We also like the simple-but-effective design of the water tank, which illuminates so you can keep a beady eye on how your water levels are faring. We’re also keen on the streamlined design, which makes cleaning the Breville HotCup Hot Water Dispenser a doddle. And, as with any decent hot water kettle worth its salt, the drip tray can be easily removed and cleaned too, which is mighty handy if you’re a little slapdash with your cups of hot water. The design is such that you can fill up the tank by holding the unit under a tap, just like those old-school kettles. Simple. The Morphy Richards 131004 Hot Water Dispenser looks like it means business with a design and build that is solid but slightly uninspiring. We do like the digital display, however, that gives crisp and clear information on what it is up to in terms of setting levels and so on. You can select the water temperature that you want dispensed, right up to 100 degrees and the amounts can range from quick one-cup offerings through to pan-sized amounts for speedy cooking preparation. Brita technology (with Maxtra filters) should stop, or at least slow, limescale build-up. While that’s nigh on impossible to prevent if you live in a hard water area, Brita filters are effective, though replacement filters are an additional cost to consider. It’s a plug-and-go machine too, so completely standalone with a 3 litre capacity water tank. The VonShef is versatile too, allowing you to select the precise amount of water you want to be dispensed. So it’ll save you some money over time by avoiding wastage. Adding to the appeal is its rapid boiling potential, with 95oC water being ready to go in between 5 and 8 seconds. We love the simplicity on show here, with an On/Off button being pretty much the beginning and end of the hot water story. A 2.5 litre tank capacity means that the VonShef is good for around ten cups in one session too, so it’s perfect if you’ve got sizeable hot drink cravings, a family or pots to fill in a hurry. The Cooks Professional Electric Instant Hot Water Dispenser follows a similar theme to the VonShef with elegant looks that kid you into thinking it should have cost more than it actually did. It also comes in different colours, so you can almost match it to your kitchen decor. It has a generous 2.5 litre capacity, which means you can get lots of cups of boiling water between refills and we love the clearly marked water container that lets you see instantly the state of play on your aqua levels. It also seems pretty precise at filling your cup, so there’s no waste and that should save money over time. Controlling water flow is done using an On and Off button, which requires minimal effort and therefore makes it a hit with us. However, we also like the easily removed drip tray, which can be swiftly emptied and wiped over if you’re a little too slow on the uptake on the difference between full and empty. -Well, it's hideous, isn't it? There’s an awful lot to like about the Addis Thermo Pot Instant Thermal Hot Water Boiler. It’s a bit pedestrian in the looks department – and that's being diplomatic – but the features come thick and fast, plus there’s a capacity of 5 litres, which makes it ideal for anyone needing hot water and lots of it. The stainless steel finish promises durability, the carrying handle is useful when it’s time to fill up the tank and we like the overall ease of use on offer. A one-touch button dispenses up to 600ml of water in one serving, while the LCD display is handy for seeing what setting is currently selected. You can buy the Addis Thermo Pot Instant Thermal Hot Water Boiler with two different capacity options too, with a slightly more frugal 3.5 litre model being ideal if you’re not in need of 5 litres of water anytime soon. Addis states that the unit only needs 680 watts to boil the water you need, which is then kept constantly hot using a further 2 watts. Impressive.